Workbench feature on the Big Gunz. For some other work in progress photographs see this page. You can find out about the Big Gunz as well. For Orks I use black, for Gretchin and Grots I use a white undercoat as it usually results in a lighter look for the Grots and a darker look for the Orks. Once the white undercoat is done, the skin tones are painted in Goblin Green. Equipment is then painted black. Generally I prefer to flock "early" so that the undercoat "seals" the flock in (as with the models at the top of the page). However some of these models they were flocked late! The next stage is to highlight with Bilious Green and drybrush the tools with Boltgun Metal. Cloth areas are painted brown. Originally I had been using Bilious Green with my Grots. However I have encountered one issue which is Games Workshop now no longer make Bilious Green. So I have swapped to Scorpion Green which looks similar. The base Goblin Green was highlighted with Scorpion Green. 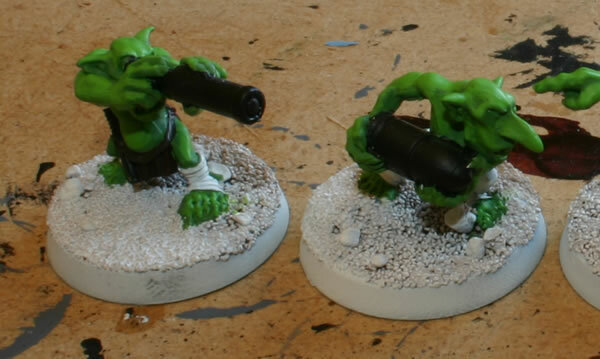 This is a closeup of two of the Grots.